Cons: However, we must also be aware of the downside of technology for our children. To flourish in the real world children still need emotional resilience, social competence and the basic skills of reading and writing, so we have to ensure that too much technology too soon doesn’t threaten their real-life development or expose them to harmful material. For children aged three and above, there are some good kid’s TV shows that can be interesting and educational. What’s more, there are many shows you can enjoy with your kids. Sensible television watching can contribute to child development and family life. Unfortunately, there’s also a lot of rubbish. If children are allowed to have access to the net in the privacy of their bedroom without supervision then it’s very easy for them to access violent or sexually explicit movies as well as YouTube videos with a lot of swearing, for example. Given that children learn by imitation, they will quickly begin mimicking what they hear and see. Insist that all Internet-connected devices such as tablets and console games are used in a family room and make sure you know what your child is doing on them. Take the TV and other mobile devices out of your kid’s bedroom. An alternative is to insist they have their bedroom door open when they are doing their ‘homework’ on the computer. Keeping the computer in your room too helps limit their usage to what they need to do on the computer. Monitor what your children watch on TV, films and DVD. Keep home entertainment in a shared area of the house to watch with them as often as possible. It’s not about ‘not trusting’ them. It’s about protecting them from things they don’t know. Set rules for the use of all devices. Only allow mobile phone usage at certain hours in the evening or after homework has been completed. If your kids are old enough to be using the computer on their own, they are old enough to understand that there are rules they need to abide by. Breaking them should not have a lesser consequence than if they broke a rule in the offline world. Having an open line of communication is crucial the minute your kids start using the Internet more independently. Make sure you know as much as possible about any hardware and software that comes into your home.If you aren’t able to put in the time and energy to find out about an electronic device, don’t let it over the threshold. Agree on time limits for logging on, playing, messaging, etc. each day and stick to them, no matter how much they nag or cry; don’t give in just to silence them. You may feel like you’re scaring your kids when talking to them about the dangers of being online, but it’s better for them to be scared than to be unaware. Just as we prepare our kids for life in the real world, we should prepare them for life online. Parents are wary about their children having virtual friendships because of stories of pedophiles grooming children on the Internet. It is well established that some people in chat rooms are not who they claim to be and both children and parents need to be alert to this. You need to remind your children that everyone online is a stranger. Tell your child never to give out their real address or phone number to anyone they meet on the net.Ensure they know that your key concern is their welfare. Explain the advantages and dangers of growing up in a virtual world. Ensure your child knows that if they encounter anything on the net that makes them feel uncomfortable, embarrassed or worried they should let you know. There’s no doubt that a child’s brain development depends on warm human contact and first-hand experiences of the world around them. When a child is young, they need to spend lots of time with their parents and other real people (as opposed to virtual people), learning to communicate and get along. They should be exploring real life, starting at home, then moving out into the local area and beyond. As your child begins learning to read and write, this will require them to slow down their mind. They have to process sounds into words and words into sentences, while at the same time making sense of what they’re reading. Learning to write means slowing down even more, since you have to make the letters with your pencil, spell the words and sort out your grammar to express what you want to say. On the other hand, electronics speed up the mind. Computer programs encourage children to expect quick-fire, quick-fix learning. If they’re used to computer games, websites and swiping, they’re likely to find learning to read and write boring and laborious. Those who manage to get the basics often can’t be bothered to practice, and true literacy takes years of practice. Regularly read to your child. You don’t have to buy lots of books; take them to the library. Read Qur’an to them and speak to them in your native language. They can pick up more than one language. Once they have learnt to read, they should read everyday for at least half an hour. Children love to play and be amused. Computer game manufacturers have subtly hijacked the language of play. Many children now think of play as something you do on a PlayStation and games as something you play on an Xbox. As much as distracting children (especially boys) from real-life play, which they need, too much virtual play may actually deter development. From a parental point of view, it’s our duty to help our children grow up to take advantage of the good stuff, rather than be distracted and damaged by the bad stuff too early on. Despite having ‘interactivity’ all over the advertising, there’s little genuine interactivity about virtual play, at least in the simple games and websites aimed at children. The child has only limited control, with no opportunity for true creativity. But children are easily fascinated, and so they grow dependent on screen-based gadgetry for entertainment, rather than learning to think independently. Unfortunately, some parents allow their young children to have access to 18-rated violent games, such as Grand Theft Auto and Call of Duty; under-tens often persuade their parents that ‘they’re not that bad’. Fathers, uncles and older brothers play these games in front of young children or allow them to play with them thinking they are toughening up or bonding with them. Adults need to wake up and realize that modern computer violence of this kind is seriously nasty, and because children don’t experience any real pain whilst playing they become desensitized to violence. There is also evidence that it encourages aggressive, violent behavior and creates negative attitudes towards women. Computer games can be exciting and some help develop new skills. Help your child choose wisely and play new games with him/her so you know what they are. Never give in to pester power. Don’t fall into buying things out of guilt; spending time with your child is better than spending money on your child.The earlier you make this stand, the better, but whatever the age, be firm. If you stick with it, your child will eventually realize you can’t be manipulated. Be honest. Are you spending more time with your laptop/phone than with your family? Are your kids just imitating you? You may spend a lot of time on WhatsApp and your partner may like relaxing by playing Halo. So many of us now bring our work home with us or like me work from home, and it’s eating into our family time. When we come home from a busy day we all want to relax and forget about everything, and on-demand movies and unlimited TV shows help us do that. We have to be firm with ourselves about this, and recognize that we need to care more about our actual family and less about the fictional characters on our screens. Always remember to ask yourself if you’re setting a good example. Switch off your laptop and put your phone on silent when sharing time with your family. Set times when you will check email and messages, and stick to them. Force yourself to keep work and family separate, and don’t let work-based stress overflow into family time. Resist the urge to multi-task at home. For instance, don’t have the TV on when you’re sharing meals and concentrate on the real-life interaction going on around the table. Going swimming or out for a walk or bike ride. Easy cooking like making biscuits, fruit salad, or smoothies. Going to the library and choosing books to share such as recipe books, activity books, art and crafts. Using the library books to plan a meal, plan a project, plan a picnic to the park, get the kids to help you prepare the food. Organizing a fancy dress party; all the costumes can be homemade. Teaching them a skill: knitting, sewing, gardening. This will really consume a lot of their time healthily. Rewarding them with gifts! Children love gifts. Challenge your children to not touch their gadgets except for a specific amount of time and see to it that they use their time efficiently, thereby rewarding them with prizes! Food, clothing, shelter, love, Islam and our time: that’s what we ‘need’ to give our children. 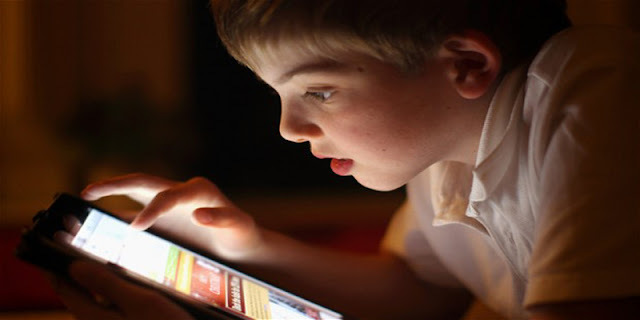 Phones, laptops and tablets are superfluous ‘wants’ that we give our children. Lets take our priorities from Allah and His Messenger(pbuh) and focus on our kid’s real needs.